Want to skip to the results? View the Chronicle Software website HERE. 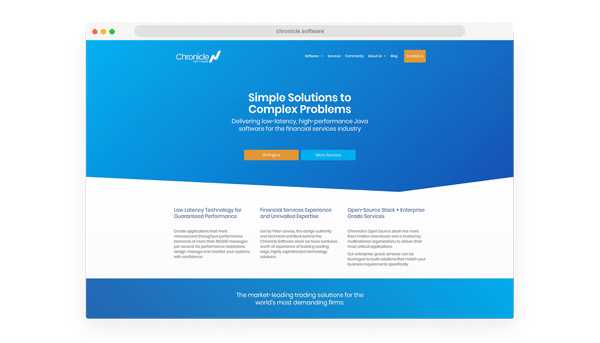 Chronicle Software is a SaaS provider, bringing market-leading low latency software solutions to the financial services industry. They were in the middle of a large company rebrand, which of course required a brand new website. One that would shout their brand to their existing audience, as well as let new visitors know that they mean business. The brief came to us through our digital partners, Gripped. Gripped is an inbound marketing agency out of London, who have worked with some enormous clients, delivering exceptional inbound campaigns, digital solutions, and brand messaging projects. It was our first collaboration of this scale together, and we couldn’t wait to get stuck in. We approached the project by first sitting down with Gripped, and ensuring that we were all on the same page. This meant understanding where they were looking to take the company’s messaging, and what the core user journeys would be as a result. Once a refined journey had been determined, Affios put together a selection of design options that matched the desired output and gave Chronicle choice to where they want to take the business. After wire framing and building out a number of core page layouts, it was over to Gripped to dissect and rebuild the content from the ground up. The result was a beautifully crafted, newly branded and well communicated solution, for an otherwise hard to understand industry for outsiders. Gripped has continued to produce excellent content for Chronicle, and Affios has supported with ongoing site maintenance. To view the Chronicle Software website, just click HERE.